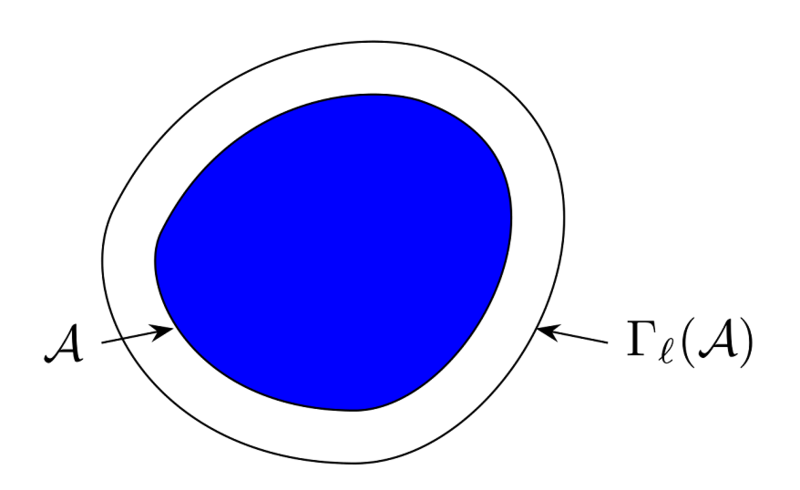 What is a small piece ot tikz code for reproducing the figure below ? Notes: I'm familiar with this question Draw a $\epsilon$ neighborhood, but it doesn't really answer my quest. Welcome to TeX.SE! EDIT: Adjusted the tension parameter to get a smoother output. This animation shows a bit what tension does. Of course, you can also adjust the coordinates. You can simply start by drawing a triangle like \draw (1,0)--(-2,3)--(2,5)--cycle, then, with the aid of a grid you start adding two control points between each pair of vertices like .. controls (a) and (b)... You need to tweak the control points a bit to get the desired shape. Look at this answer, e.g., to know more about how to choose control points. \draw[double distance=10pt,fill=blue] (1,0)  .. controls (-1.5,0) and (-2.5,2)..
(-2,3) .. controls (-1,5)   and (1,5.3) ..
(2,5)  .. controls (5,4)    and (3,0)   ..
How does one pick control points to control Bézier curves in TikZ? How can I draw a line on a specific side of a rectangle with varying width?